“Joe had a particular idea in mind, it was difficult, but the level of musicianship and competency was high and ultimately we made a great record”. NY reed & flutist Giardullo's large Open Ensemble is the first release of his G2 music since 1979. G2 is the result of years of investigations into creative compositional techniques inspired by the ideas of George Russell's Lydian Chromatic Theory of Tonal Organization. 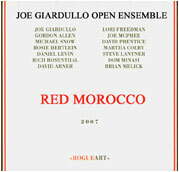 Giardullo developed those ideas into a new generation of compositions and ensemble techniques that create deeply improvising ensembles from seemingly incompatible members and instrumentations. It is an accessible and unique way to approach large group dynamics and creativity.